Toadie telling Ned what he did at Christmas last year with Stu and Connor but refusing to mention Connor's name. Kim being told that there is a riot at the prison and looking worried. Dylan telling Roo that he has the choice not to become a lifer but only if he doesn't do him. Janelle and Bree return home from Christmas shopping hyper only to meet a worried Kim and Janae and her first thoughts are for her boys. Stinger wants to know if Dylan is fine but the guards won't say anything to him. Eventually Dylan comes into the cell and Stinger is demanding to know if they are in the clear or not. Dylan's face suggests they aren't…but only for a few seconds because he breaks out into a smile, which Stinger hopes means they're in the clear. Lyn and Oscar call round to hand over the Christmas presents. They chat a bit about Susan, and then Steph asks if she has any presents or are they all for the kids. Lyn goes into a bag and brings out the box that disappeared from underneath No. 32 and Steph is mightily relieved to have it back. Boyd volunteers to put it back but Lyn doesn't think she did anything wrong by removing the box. Harold enters the house reading a letter and his expression is one of worry, so Sky quickly finishes her phonecall to Lana. Turns out the note was from Connor saying something has come up and he's made alternative arrangements for Christmas. 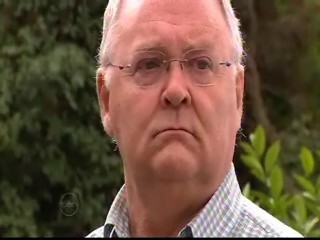 Harold is annoyed because Connor said he'd help with the soup kitchen and wants to go and discuss Connor's note with Toadie. Sky stops him and volunteers instead to take Connor's place, which Harold seems keen on but after Sky moves away his face says something else. Kim is trying to get through to the prison but is being kept on hold. In the living room, Bree and Janae talk about past Christmases, which Kim overhears and makes him realise what he's missed out on. Janelle tells him not to worry, that he is here now and that is what counts. Kim finally gets to talk to someone at the prison and is relieved to hear that the boys are okay. Everyone breaths a big sigh of relief. Lyn comes home with the shopping and after sending Kim and the girls to bring the rest in, quietly tells Janelle about the top she's got for Janae. Janelle suddenly realises that she's kept up a family tradition…forgetting someone's Christmas present and this year is Janae, so she quickly departs. On the way out she runs into Kim and the girls and tells them she's going to post some cards! The girls realise what Janelle has done and banter with each other over who Janelle has forgotten. Paul supervises the delivery of food and drink as Izzy arrives suitably dressed for Christmas day in her female Santa Clause outfit. They are both surprised to see Elle arrive home and she explains that Tassie is off because there was an airport strike. She wonders if they haven't gone OTT and Paul replies yes. Harold and Sky come out to check the mail and notice the happy scene outside No. 22. She doesn't think it is right but Harold says she shouldn't have bad thoughts and everyone celebrates the birth of Jesus in their own way. Sky still isn't happy at the excesses and describes it as being obscene. Harold looks over to the three of them and puts on ‘his face' again like earlier. Lyn is telling Oscar that Santa has been because the biscuits have been eaten and the beer drunk. Oscar tries to grab the glass (there is a wee bit left at the bottom) and Lyn quickly removes it from his grasp and gets his attention instead to the pressies - a very big box, which was hiding a tricycle for the wee man. Being a kid though, Oscar is more content to hide in the box instead. STINGER: We get let out of jail and this is the best you can do? Dylan and Stinger tell them the story about how they got out of prison and Janelle is overjoyed her boys are home for Christmas. The opening of presents continues, this time at No. 32 and the kids are both pleased with their pressies so far. Max asks Steph how she slept last night and she had no dreams, probably due to the fact that the box is safely back under the house. Lyn and Oscar on his bike come round and Lyn tells them about the boys being out of prison. Lyn asks Max to help her take the food over and he agrees once Boyd has opened the envelope containing his VCE results (Boyd and Sky make a pact not to open them until Christmas day). Boyd opens the envelope to find he got 99.6 and cue more celebrating. Janae watches Boyd run out of the house and over to Sky. He eventually tells her about his 99.6 and Sky her 85 which will get her into the course she wants. They hug each other and Harold offers his congratulations too. Janelle sneaks over without Kim knowing, to tell Paul about Dylan and Stinger being out of prison thanks to Stu. Janelle has obviously been at the sherry a bit early, as she announces to them (Izzy has joined Paul at the door) that they are her new favourite neighbours! Paul and Izzy wonder what planet she is on as Elle comes down the stairs chatting away to ‘Neddy'. She hangs up on Neddy and tells her dad that not only is she happy but that she is so looking forward to their first Christmas lunch together. Paul asks how Gail took the news and she replies that she has the boys with her and he tells her to phone again later. Boyd and Sky are still on cloud 9 after finding out about their exam results and Kim asks Janae if she is going to give Boyd her present. She is a hesitant because she thinks it is a bit juvenile but it's too late to back out now because Kim shouts Boyd over. He says goodbye to Boyd and Janae ‘thanks' her dad before moving towards Boyd. Janae hands over her present (a 4 leafed clover) and Boyd is surprised (he's never seen one before) but pleased to have it due to the luck it carries. They say “love you” to each other and have a quick kiss and hug before Boyd hands over her present, which isn't to be opened in front of her parents! Steph and Max are with Oscar and his new bike as Santa ‘Lou' Clause approaches and gives Oscar a present and he replies “thank you” and everyone watching goes aww, cute! Santa goes on his merry way and gives Harold and Sky some presents and informs them that he'll be dishing out gifts at the caravan park later. Sky's attention is drawn to someone whistling and notices that it is Dylan who is doing the whistling. She runs to him wanting to know details of why he is there and Dylan promises to tell her all once she's had Christmas lunch with them. Sky replies that she can't because she promised to help Harold at the soup kitchen but he tells her to go and ropes Santa in to help instead. As we head into the commercial break, Dylan tells her that them splitting up was a load of rubbish and Sky realises this and they have a hug to celebrate. Commercial break over, after finding out about Lyn and Joe; Steph brings Summer over to feel the baby kicking. Not to be outdone, Boyd and Max put their hands on Steph's belly too. They party is in full swing at No. 26 with Janelle and Kim dancing and the kids ‘fighting' with each other and Sky relishing the fact she is there. During a break in the fighting, Dylan congratulates Sky on getting the marks needed to get into Uni. In the kitchen, Janae announces to her parents that the sight of them dancing is tragic! Kim asks her how Boyd liked his present, worked like a treat she says, before Janelle asks what she got from him. “Some stuff,” relies Janae and distracts the grilling she thinks she is about to get by saying she can smell something burning. As rest of the kids plus Sky come into the kitchen, Janelle discovers that the turkey is burnt and Dylan says that if they give him an hour he can rescue Christmas lunch. They all pull straws, which puzzles Sky and Dylan explains that it is tradition and Janelle realises that she has pulled the short straw. Sky is still puzzled as to what is going to happen. Paul hangs up to Neddy much to Elle's annoyance (she has phoned him 5 times in the past 2 hours!) but her annoyance is short lived when Paul hands gives her a bag with her present and opens it to find a silver bracelet. Izzy hands over her present - a sock to Paul and some lingerie to Elle, which she says “wait ‘til Ned sees this!” Elle hands over her present to them both, and Paul opens it to find a photo of the 3 of them. Paul decides it is time to switch on the Christmas lights and have some food and Izzy tells the minions (they've been in the background getting the meal ready) that they'll eat in 5 minutes. PAUL: Let there be light. The lights come on and Elle announces that it has been a perfect day…but then something goes bang and the lights suddenly go off. “Oops,” says Paul. Paul answers the door to find an annoyed Max and Kim on his doorstep. Max wishes his sister and Elle a merry Christmas and Kim notices the reason for the blackout. Paul promises to make it up to them. “How,” says Max. …turns out Paul is giving out the free lunches, well at least the French champagne Kim and Max are drinking as the festivities now move to Lassiters. Kim tells Max that he'd rather have a VB any day than the champagne but still continues to drink it. “Christmas day with your family and friends, what could be worse” says Max and we find out that there is a gatecrasher to the party - Drew! He sits down next to Steph, impressed with the party. Drew wishes her a happy Christmas and she wishes him a merry Christmas. He then tells her that it has been great being there with her but he has to go now and tells her to take care. Steph replies that she will before they kiss farewell. Before he goes however, Steph wants to know why did he come here. Max wakes Steph up and tells her that they've to take Summer to the airport and Steph realises that she dropped off to sleep. Santa Lou and Harold arrive and Sky tells them about the blackout and Paul shouting everyone to a free lunch. And Harold is shocked to find out that Paul is paying. Sum thanks Bree for a book she received, promising to read it on the plane and Boyd asks if Stinger fancies going for a skate when he gets back from the airport. Paul hands out the champers and Santa Lou gratefully accepts but Harold puts his down on a nearby table. Paul then sees Dylan and welcomes him home with a hug. Dylan thanks him for his help trying to get him and Stinger out of prison and that he won't forget it. Janae and Bree watch as their parent's pash underneath the mistletoe. Bree thinks it is gross while Janae thinks it is “disgusting and totally wrong” as Sky and Elle pass then, chatting about getting their man. In a corner, Izzy tells Paul that it seems like the rest of their neighbours have finally accepted them and Paul replies that they're accepting the freebies as Elle comes over and joins them. Harold thanks Santa Lou for his help today, which Lou replies that it was no problem as they observe Izzy and Paul pulling crackers. Harold gets ‘his face' back on again as he stares at them being happy.